We have one collection of Brontë juvenilia in the library catalog: Tales of Glass Town, Angria, and Gondal: Selected Writings. Why should you read the early writings of the Brontës? "The writings of Glass Town, Angria, and Gondal are youthful experiments in imitation and parody, wild romance and realistic recording; they demonstrate the playful literary world that provided a 'myth kitty' for their early - and later - work," the book's blurb proclaims. We had already heard a little about these early writings in recent stories about discovered manuscripts. 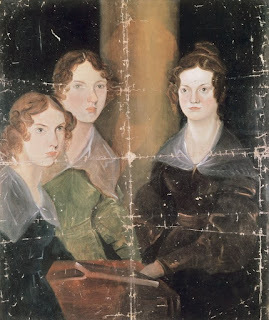 When we read Worlds of Ink and Shadow for this challenge during the summer, one of the most interesting aspects of that novelization was the recreation of the Brontë siblings writing together - in Lena Coakley's book, their collaboration had a fantastical bent, but the idea of them working together despite differing viewpoints and shifting alliances was nevertheless compelling. It's quite the story - their father gave Branwell a set of toy soldiers for his twelfth birthday (Charlotte would have been thirteen, Emily eleven, and Anne nine), and each sibling claimed a soldier for their own "character". These soldiers were the beginning of the Glass Town stories, which evolved into Angria (primarily Charlotte and Branwell's domain) and splintered off into Gondal (a special project of Emily and Anne). Charlotte started out with a character based on the Duke of Wellington; Branwell chose Napoleon; their sisters favored naming their characters for the explorers Parry and Ross. These stories were inspired by those the children had been reading in Blackwood's Magazine, and colored by their readings of classics such as The Arabian Nights (possibly the reason the siblings referred to themselves as "Genii" in their stories?) and Romantic poetry. The book is split into sections, so you can read writings by each Brontë - there are 300 pages of Charlotte to only 72 of Branwell, and even less of the younger sisters' output. Though only the poetry about Gondal survives, scholars have ruled it especially important link in the creation of Wuthering Heights. Charlotte's section includes two full-fledged novelettes, Mina Laury and Caroline Vernon, which both show her increasingly mature authorial voice, while Branwell's features both prose and poetry. Stories of Glass Town and Angria are actually set in a wildly inaccurate imagining of Africa and are studded with wars and political maneuvering and a complicated social structure, while the Gondal narrative, what can be reconstructed, appears more confined (literally, as dungeons are much mentioned) and harsh, with its main characters being dour and severe, a Yorkshireman and a Scot. Ultimately, the siblings grew apart. Branwell and Emily still composed their sagas as adults, while Anne and Charlotte moved away from the juvenilia that sparked their earliest literary creations. But the juvenilia collected in these selected writings remain a fascinating glimpse into collaboration and process, if you have the inclination to immerse yourself in their world. This edition also features a glossary of characters and places, copious explanatory notes, and Emily and Anne's six "diary papers", which reveal both life at Haworth and more about Gondal, including this touching passage from Anne on the occasion of Emily's twenty-third birthday: "We are now all separate and not like likely to meet again for many a weary week but we are none of us ill that I know of and are all doing something for our own livelihood except Emily [the only sibling still at home] who however is as busy as any of us and in reality earns her food and raiment as much as we do." Eight years later, both sisters and their brother Branwell would be dead, predeceasing Charlotte by only 6 years.